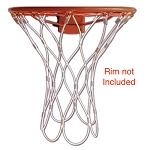 Basketball hoops have many different features that help prolong the life of the system. For instance, most basketball hoop manufacturers provide some sort of protective covering on metal parts to prevent rusting. However, there are still some things you can do to help your basketball hoop last as long as possible. Here are some suggestions. Make sure you always follow instructions and maintenance requirements set forth by the manufacturer. Rims typically last a very long time when used non-aggressively. However, when used aggressively they tend to wear out much quicker. To prolong the life of the rim, consider taking it down during rough weather conditions. For instance, rims are damaged or ruined most frequently in windy storms. Whether your basketball systems has a portable base and wind blows the system over, or you have an inground system that has a tree fall on it, taking down the rim during a windy weather time will certainly prolong the life of the rim. The rim is connected via several bolts to the backboard. 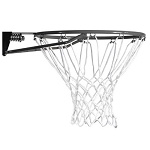 If the rim is tugged on roughly by a falling tree, or smashed up when the basketball hoop tips over, you risk damage to the backboard as well. During particularly cold and wet seasons, considering covering or moving your system indoors to help prolong the life of the system. For instance, portable basketball hoops can be lowered to their lowest setting and then wheeled into a garage to avoid cold, wintery months. In-ground basketball goals can sometimes be removed from the ground and moved indoors as well. To do this, your basketball system will need either a bolt-down anchor kit, or a ground sleeve to be removable from the ground. Limiting exposure to harsh weather conditions will definitely help prolong the life of the system. Other maintenance activities are frequently outlined in your owner's manual for your goal. These types of activities might include such things as lubricating movable parts, drying critical parts after rainfall, or tightening hardware. Following these steps will also help provide a longer life for your basketball hoop. Make sure to take good care of your system to get as long a life out of it as possible. 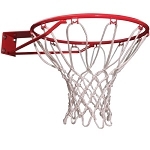 Basketball hoops are very durable but it helps if you protect them from the elements. Enjoy your system. Maintain and take care of your basketball hoop, so that it can and will last for as long as possible. Lifetime basketball hoops are already strong and durable, but you can keep them for even longer if you know how to properly take care of them, especially from things like the weather.